Another year has passed, and Christmas is but a blink of an eye away, and yet it seems like this year has just begun. Strange. Mrs D got a new car. I took more photographs than ever before. The BC Lions won the Grey Cup and I won season tickets to the games next year! We had a freak snow storm that turned the city upside down in November. I spent a lot more time teaching Judo, and am pleased by the improvements I see in my students as they progress. 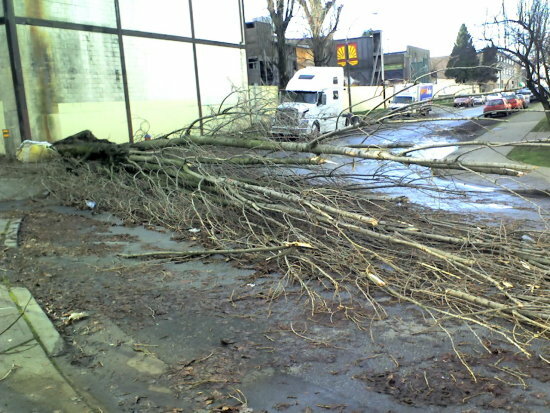 We had wind storms that uprooted over 1000 trees in Stanley Park, and almost put a fir tree through our home. It’s been a busy year. The travelling seemed to break things up a lot and that makes it feel like it went quickly. There were definitely times when I wish I could have stayed at home with Mrs D and just gone fishing. Next year, I want to spend more time on the lakes with Mrs D, and watch as she feels the thrill of catching her first fish on the fly. The trip to China and Hong Kong was amazing, and having my wife there with me to help and guide me was indispensable. I hope that we can go on trips like that again, to other exotic and interesting locales. I want to get back to Ontario and visit with my aunt, uncle, cousin and grandfather. I want to get down to Michigan to hang out with my sister and her family. I don’t have big material items on my wish list this year. I just want more time with the people that matter. Which to me, is what Christmas is all about. Gifts and Santa are for kids. As adults we need to look deeper, into our hearts and find the things that REALLY matter, and make them happen, somehow. That’s it really. Electronics have brought our world closer, but it has also allowed us to be further. Close that physical distance, and see, touch and feel the joy of being with someone, rather than just emailing them. I’m going to start by heading off to Lake Louise tomorrow to visit my cousin! Merry Christmas and a safe Happy New Year to all! Apparently, "National Security" in the US is new buzzword for "It makes us look bad"
A recent opinion article in the New York Times was edited by the “Central Intelligence Agency’s Publication Review Board” to remove passages that had no “Security” implications. The author had passed the document through board, and all was well, until the White House stepped in and said “Make them remove the following…” Apparently “National Security” could be compromised by people knowing publicly available materials. 1. “Central Intelligence Agency’s Publication Review Board”??? Wow. I thought things like that stopped after WWII or Vietnam. I wonder how they decide what to check over, and how many people there are. Surely there are hundreds of thousands of columns being printed all over the US. How are they to know which ones will be blabbing about National Security issues? 2. When will the Executive Branch of the US government keep its grubby paws off the rights of the people to discuss information that puts it in a bad light? Life is NOT a giant scripted TV show…. You HAVE to take the good with the bad. You can’t just hide the bad. You folks down below the 49th are heading for a real life nightmare if this keeps up. 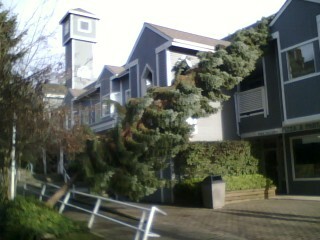 Wicked Wind rolled through last night. Winds up to 100kph in the city! My house is just to the left of the frame in the picture above. Thank God it was blowing the OTHER way! This poor guy was a block from my work. Possibly one of the reasons we had no power at work this morning until 1100. Good times had by all!